Acquire NED and DOQ/Imagery data from the USGS National Map data warehouse. 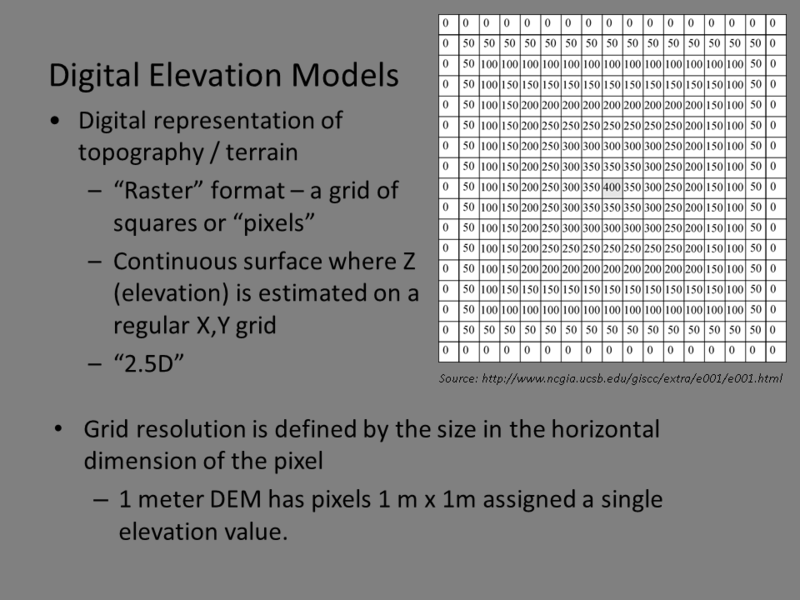 NED stands for National Elevation Dataset, which provides nation-wide coverage of a digital elevation model (DEM). DOQ stands for Digital Orthophoto Quadrangle and is basically a georeferenced and rectified aerial photograph. 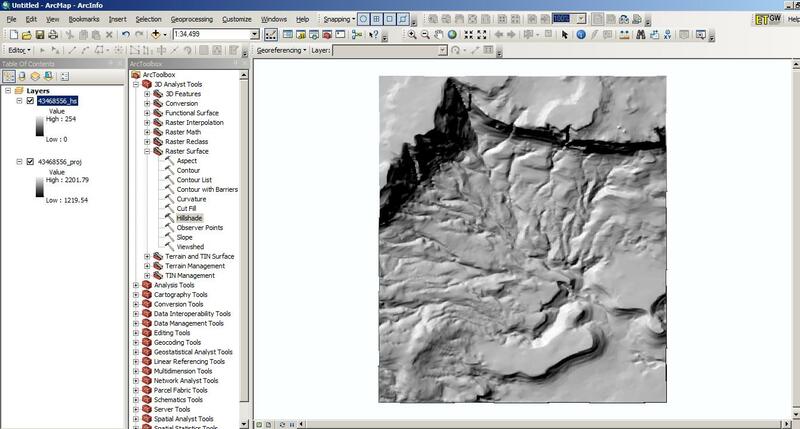 Load these datasets into ArcMap and project them into the correct coordinate system. Produce a hillshade from the DEM. Quick reminder of what is a DEM. 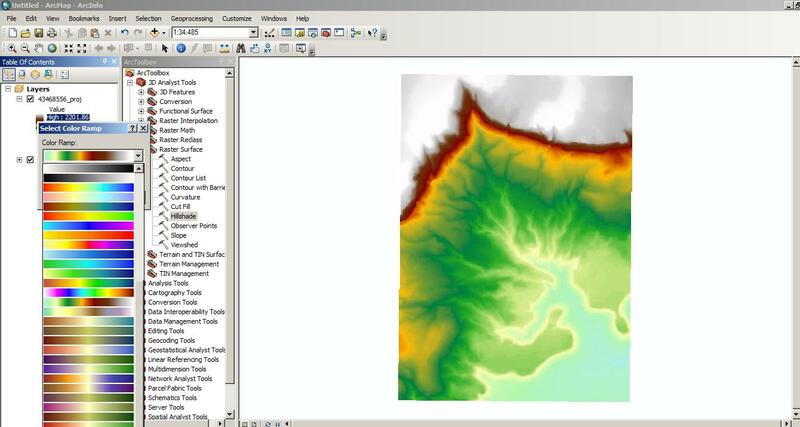 Produce a simple map in ArcMap. The USGS National Map provides access to lots of great base data for projects you may be working on. It is important to note that prior to a few years ago, much of the National Map functionality was available through the Seamless Server but that has been discontinued. This PDF covers the main steps you need to gather data for a site from the National Map. 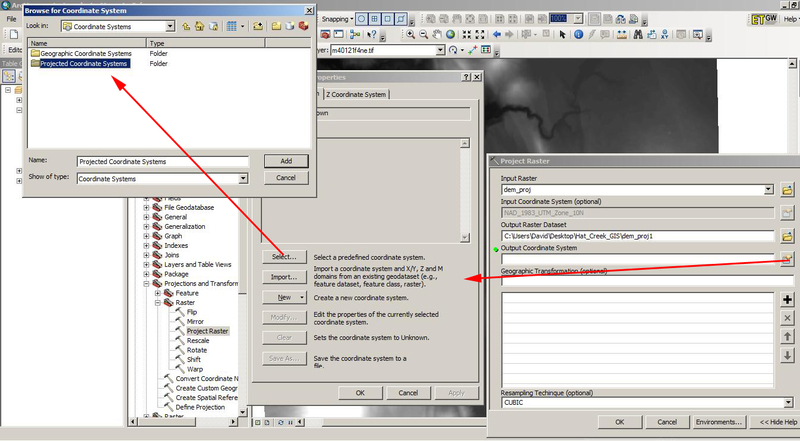 Start ArcMap and click the Add Data button. This will open up a window that will let us browse to the data. 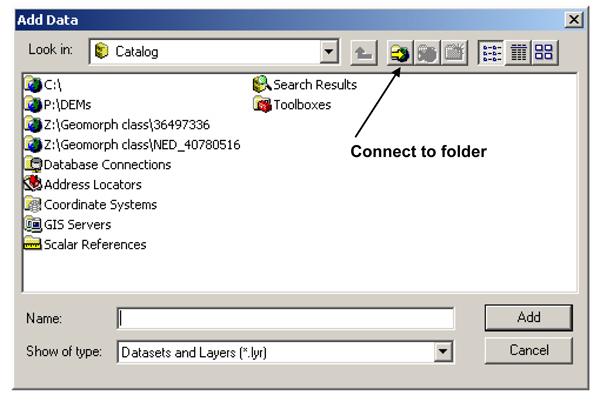 Click the Connect to folder button and navigate to the directory that contains your data. Click OK. This will add that directory to the Add Data window. 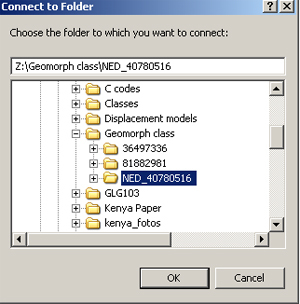 Navigate to your NED data folder in your GIS directory, select the DEM file (extension .tif), and add it. Behold the Vermilion Cliffs DEM!! Now is a good time to save your ArcMap project (as a .mxd file) somewhere in your GIS directory. Notice that the map units are in decimal degrees (located near the bottom-right corner of the ArcMap window). It's much easier to think in meters than decimal degrees, so we're going to project the DEM into the UTM coordinate system. But before we do this, let's first check in which UTM zone the Vermilion Cliffs are located. Using the UTM Grid Zones of the World webpage compiled by Alan Morton, we see that the Vermilion Cliffs are located in UTM Zone 12. In fact, almost all of Arizona is located in UTM Zone 12! In ArcMap, start ArcToolbox (little red toolbox icon) and navigate to Data Management Tools --> Projections and Transformations --> Raster --> Project Raster (double click). 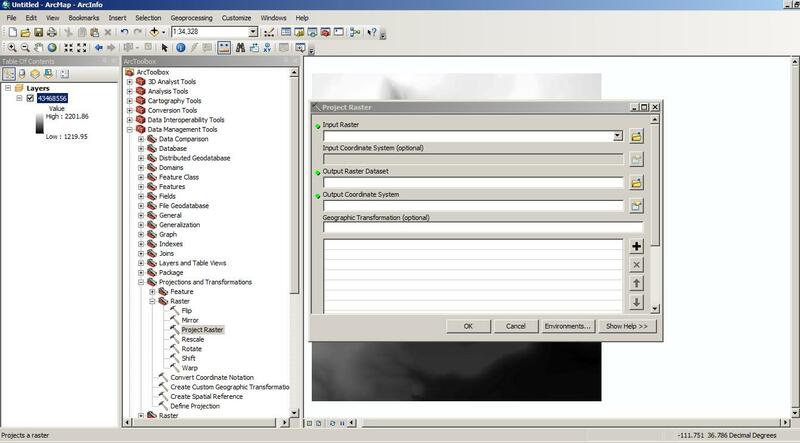 Click and drag the DEM layer from the Table of Contents to the Input Raster field. You will notice that this automatically fills in the Input Coordinate System field for you, in our case telling us that our DEM is in the GCS_North_American_1983 coordinate system. For the Output Raster Dataset field, click the browse button and navigate to the directory to which you want ArcMap to write the new projected DEM. Give the projected raster a new name. For the Output Coordinte System field, click the browse button and make sure you are in the XY Coordinate System tab. Click the Select button and navigate through Projected Coordinate Systems --> UTM --> NAD 1983 UTM Zone 12N (double click). Then, in the Resampling Technique (optional) field, select CUBIC and hit OK. This will begin the projection process and may take a minute or two depending on the size of your DEM. Once the newly projected DEM is displayed in ArcMap, go ahead and remove the old unprojected DEM layer from the project (right click and select Remove). Now is a good time to save your project (Ctrl+S or hit the save button). 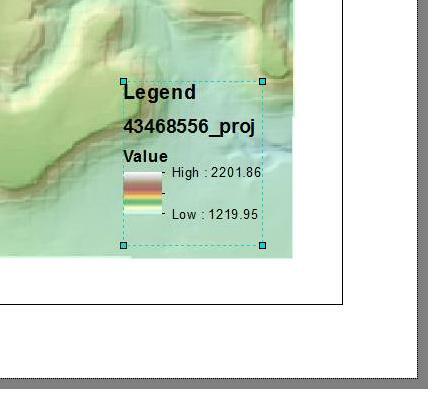 Note that ArcMap defines the projection of the entire project according to that of the layer that was first added. So for our example, our ArcMap project is still in the old projection! To fix this, go to the Table of Contents panel, right click Layers and click Properties. This will open up the Data Frame Properties window. Under the Coordinate System tab navigate through Predefined --> Projected Coordinate Systems --> UTM --> NAD 1983. Select NAD 1983 UTM Zone 12N and click OK. This will change the projected coordinate system of the entire project. But notice that the map's units are still in decimal degrees even though our data are in meters. To change this, open the Layers properties again (right-click --> Properties), click the General tab, change the Display units to meters, and click OK. Now the map units are displayed in UTM meters. (3) Produce a hillshade from the DEM. You might have noticed that our DEM doesn't really show much beyond what looks like a simple drainage network. To improve the visualization of these data, we will build an artificially illuminated hillshade from the DEM. 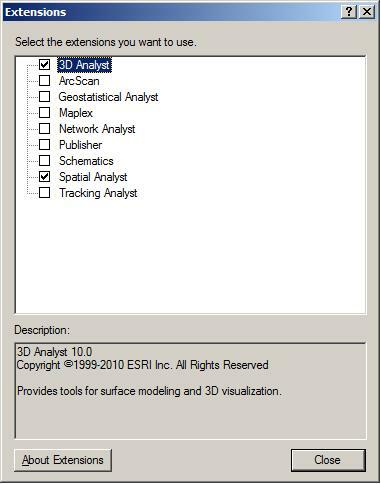 Before we do this, we first need to enable the 3D Analyst and Spatial Analyst extensions in ArcMap. In the main ArcMap toolbar, go to Customize --> Extensions... and check the 3D Analyst and Spatial Analyst boxes. 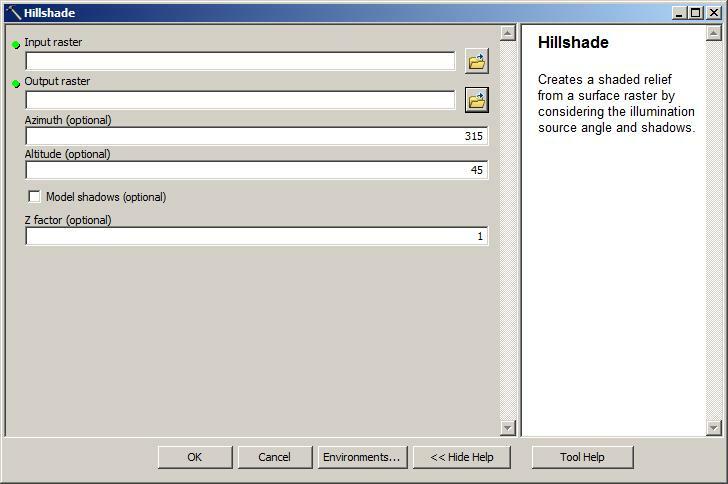 In ArcToolbox, minimize any expanded tools you have open and navigate through 3D Analyst Tools --> Raster Surface --> Hillshade (double click). Now is a good time to save your project. (4) Produce a simple map in ArcMap. Let's turn our ArcMap project into a nice map. 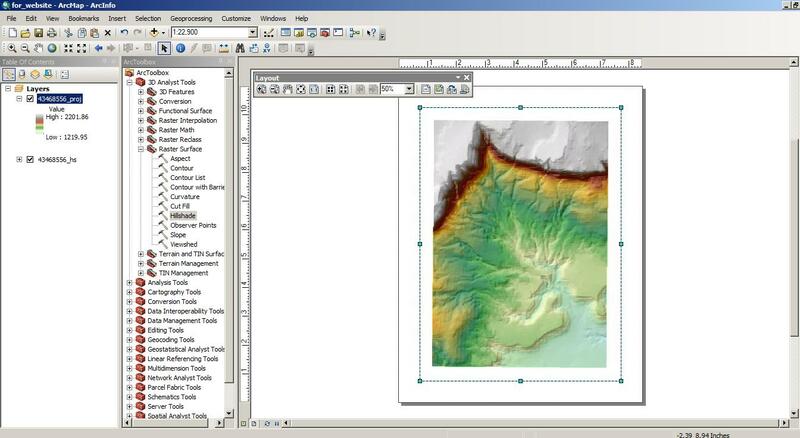 In the Table of Contents panel, click and drag the DEM layer above the hillshade layer. 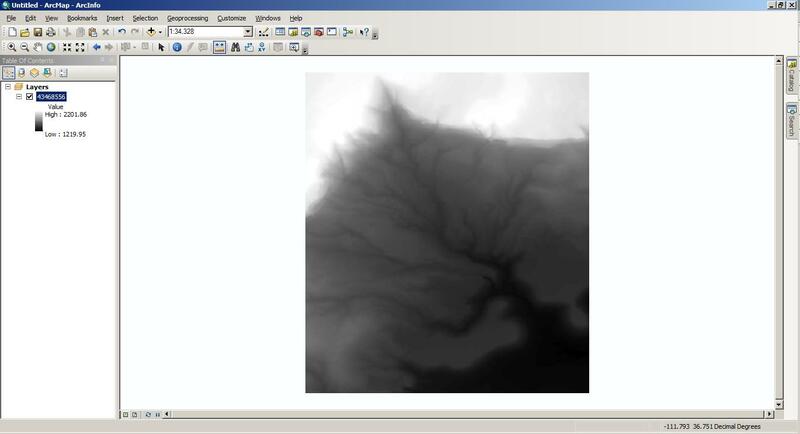 We are basically rearranging the layers so that the DEM layer is displayed above the hillshade layer. Now change the color of the DEM layer by clicking once on the DEM's color ramp and selecting a color ramp of your choice. Right click the DEM layer and select Properties. This will open up this layer's properties from which we can change many things associated with this layer. Select the Display tab and change the Transparency field to 40%, then hit OK.
Let's add some important components to our map: a scale bar, north arrow, and a vertical scale. Near the bottom of the map panel is the Layout View button. Clicking it will take you to the layout view of your map. This is basically what our map would look like if we were to print it. 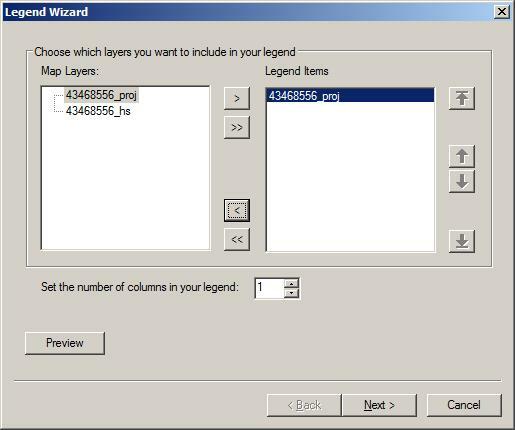 In the main ArcMap toolbar, click Insert -- > Legend . You can toggle which layers to include in the map's legend by using the left- and right-pointing arrows. For our map, let's just include the DEM layer in our legend. Our legend looks OK, but Tufte would definitely not be happy with us considering the unnecessary information present there. 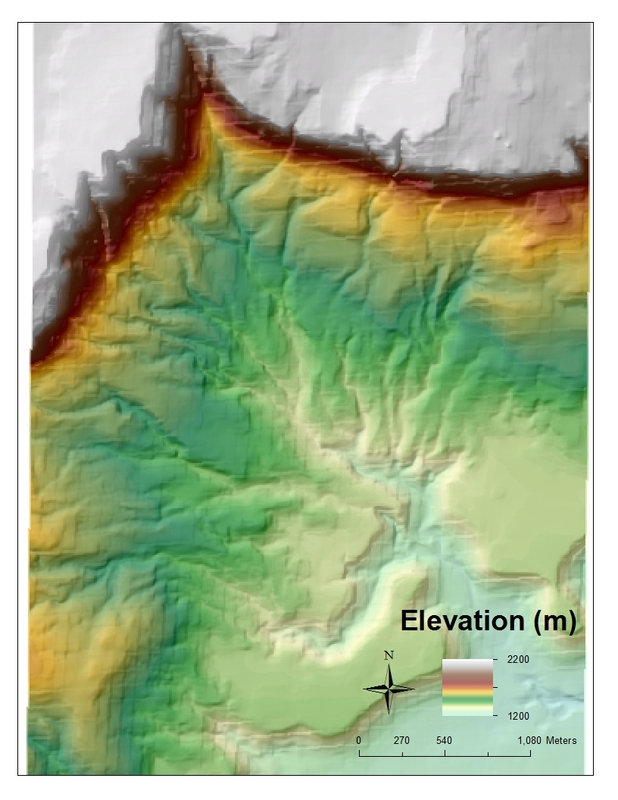 For example, let's get rid of all those significant digits and round up/down the elevation extents for our map. To do this, right click the DEM layer in the Table of Contents panel and select Symbology. In the Label fields, delete the "High:" and "Low:" text and round the elevations to whole numbers. Click OK.
We still have unnecessary information like the layer's name. Right click on the legend itself and select Properties. Click the Items tab, then the Style... button, then the Properties button, and finally the General tab. Unselect the Show Layer Name and the Show Heading boxes. OK out of everything to return to the map. 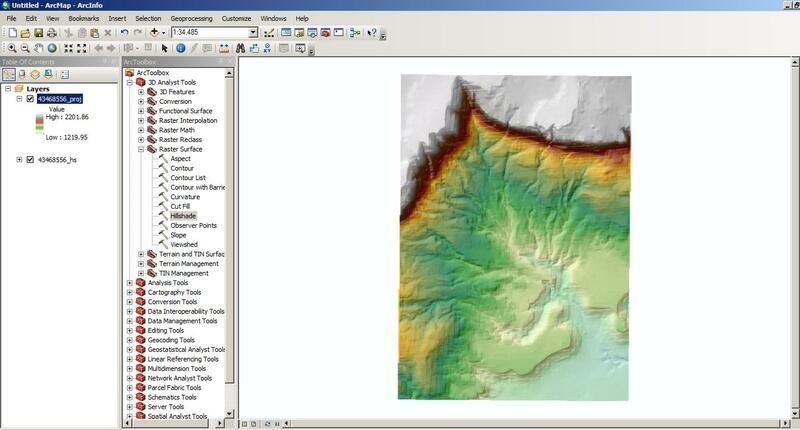 The following videos are demonstrations for some useful activities in ArcMap. Check them out and practice! These use high resolution topography data downloaded from http://www.opentopography.org/. I helped to found the OpenTopography project. It is a great source for high resolution topographic data (<1m/pix) and also we have the Shuttle Radar Topography Mission topography data available in a simple clip and ship map based interface. Look under the raster link. Page written by David Haddad and Ramón Arrowsmith, with some items borrowed from Olaf Zielke. Last update: October 27, 2015.